You've found the “U.S. Frizzle Chicken Breeders” page here at Hobby Farm Wisdom! If this is the first time you have visited our site: Welcome! Frizzle chickens are one of the most unique looking chickens out there but they are not recognized as an individual breed in the United States. They are however recognized as such in many European countries and Australia. If a chicken is referred to as a frizzle, it is because of a genetic characteristic that gives them the appearance of curly or frizzled plumage. If the gene is present, it causes the feathers to curl outward instead of lying flat like a typically chicken. 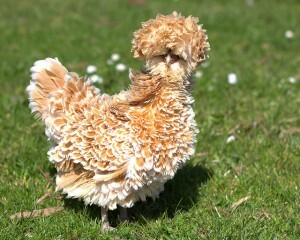 Any breed can be bred as a frizzle but the popular breeds used as Cochins and Polish chickens. Frizzle chickens are typically good egg producers, producing a white or tinted egg and frequently go broody. They are good foragers but the curled feathers do not fare well in rain.